Mecoptera (scorpionflies) are the most special pollinators in Mesozoic, which bearing siphonate proboscis and highly degraded hind wings. Early researches suggested they should have symbiotic relationships with contemporary gymnosperms, but lack of fossil records of pollen adjacent to insect body, and the systematic position of this lineage is not clear. Our study provided the first direct evidence of pollination in early Mecoptera, discovered a new type of long proboscis, and also reconstructed the phylogenetic relationship between the two-winged scorpionflies and other related groups. Modern Mecoptera are a small relict group, due to the expanded and upward male genitalia similar to the scorpion tail sting, commonly known as "scorpionflies." However, extinct mecopteran groups are more abundant with morphological and behavioral variation, and greater diversity in feeding and mating habits. Among them Aneuretopsychina are the suborder with long tube-like mouthparts, and the earliest fossils are from the Upper Permian of European Russia , only five families hitherto, including the new family (Dualulidae) described in our research. a, Lichnomesopsyche gloriae Ren, Labandeira and Shih, 2010, CNU-MEC-NN-2005020-1. Donated by Dr. Chungkun Shih; b, Sinopolycentropus rasnitsyni Shih, Yang, Labandeira and Ren, 2011, CNU-MEC-NN-2010044p; c, Vitimopsyche pectinella Gao, Shih, Labandeira, Santiago-Blay, Yao and Ren, 2016, CNU-MEC-LB-2012088p; d, Epicharmesopsyche pentavenulosa Shih, Qiao, Labandeira and Ren, 2013, CNU-MEC-NN-2011095p. Scale bars represent 5 mm in a, c and d, and 1 mm in b. In 2009, Ren and colleagues detailed explained the morphological structures of long proboscis in different families of Aneuretopsychina , according to the comparison with reproductive organs of host plants first suggested Aneuretopsychina are feeding on pollination drops of gymnosperms [2,3]. 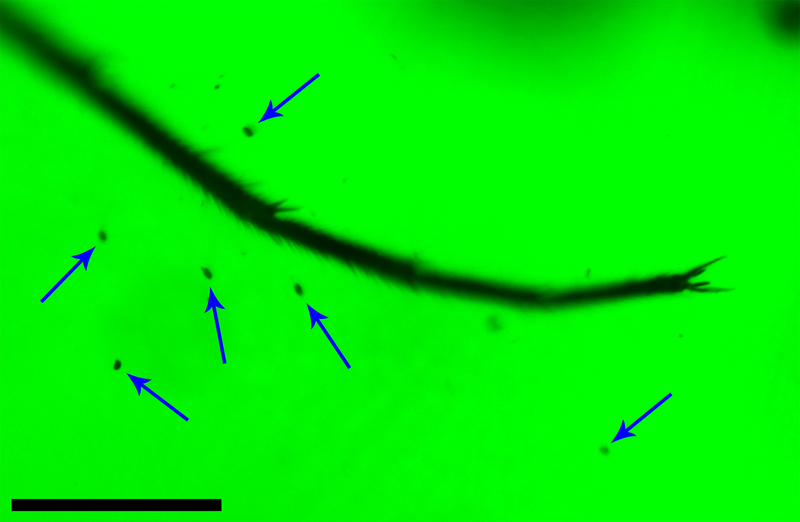 Nevertheless, no pollen grains have been found in the compression fossils at that time, which is a normal phenomenon due to the preservation of fossil specimens. Subsequently, our team has published series of relevant researches focused on the taxonomy, morphological structures and phylogenetic analysis [4–8], but still no ideal result of pollen detection during that time. In the last decade, direct evidence has been reported in a variety of Mesozoic pollinators, especially the dipteran groups (Zhangsolvidae) with Exesipollenites pollen grains . While we still prefer to believe they are specific pollinators. The blue arrows point to Cycadopites pollen. Scale bar represents 0.2 mm. Photo: Xiaodan Lin. We never gave up searching for clues. During the process of examining materials one by one, Conrad C. Labandeira finished the line drawings of head and proboscis and Xiaodan Lin took all photos. Fortunately, we finally observed two amber specimens with Cycadopites and possible angiosperm pollen grains adjacent to Parapolycentropus. Meanwhile Micro- and Nano-CT scanning help us to get more microstructures of insect mouthparts and surface ornamentation of pollen. Based on these new findings, we also corrected the original viewpoint of proboscid composing. As the diameter of channel within hypopharynx is too narrow for sucking viscous liquid, at first we suspected it should not be food channel  but salivary channel. 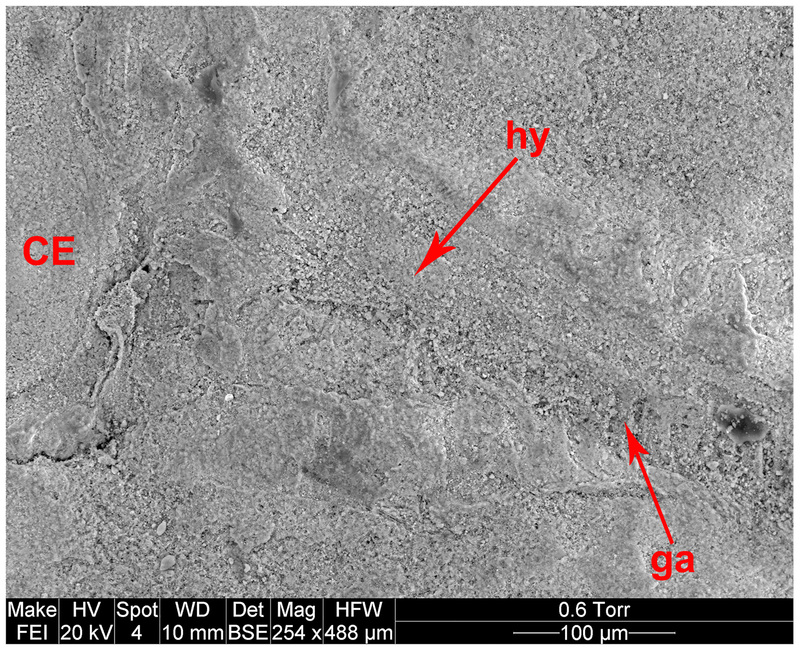 The final result of Micro-CT scanning also verified the previous conjecture that the unique mouthparts have “double-pump system”, with cibarial pump and food channel, as well as salivary pump and channel. CNU-MEC-NN-2016010c, new material. Photo: Xiaodan Lin. The phylogenetic and geometric morphometric analyses of Mesopsychidae (one family of Aneuretopsychina) indicated the long proboscis might independently originate four or five times in early Mecoptera . However, the incomplete selection of taxa and characters also reduce the credibility of this conclusion. In contrast to the analysis in 2009, this study added the hind wing degraded groups and more morphological features, hence the result of Aneuretopsychina systematic position also more close to the real evolution. By Conrad Labandeira and modified in Adobe Photoshop CC by Xiaodan Lin. 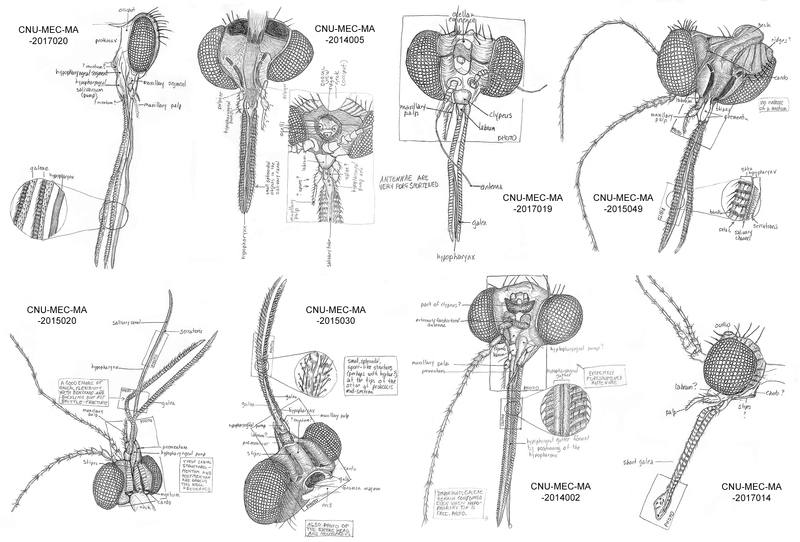 In a word, our research is mainly based on the detailed morphological analysis, used various methods of image acquisition and analysis, carried out more comprehensive phylogenetic analysis to explore the origin and evolution of mouthparts and other structures, and first reported the direct evidence of insect-pollination in Mecoptera. While the study of mating habits is just like extra harvest. 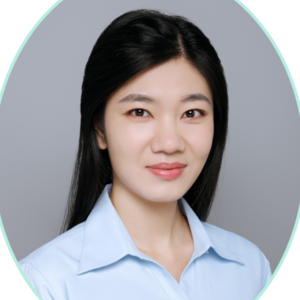 Left photo: Dr. Chungkun Shih (left) and Xiaodan Lin (right). Right photo: Xiaodan Lin (left) and Dr. Conrad Labandeira (right). Bashkuev, A.S. (2011) The earliest Mesopsychidae and revision of the family Mesopanorpodidae (Mecoptera). ZooKeys, 130, 263–279. Ren, D. et al. (2009) A probable pollination mode before angiosperms: Eurasian, long-proboscid scorpionflies. Science, 326 (5954), 840–847. Labandeira, C.C. (2010) The pollination of mid Mesozoic seed plants and the early history of long-proboscid insects. Annals of the Missouri Botanical Garden, 97, 469–513. Gao, T.P., Shih, C.K., Labandeira, C.C., Santiago-Blay, J.A., Yao, Y.Z., and Ren, D. (2016) Convergent evolution of ramified antennae in insect lineages from the Early Cretaceous of Northeastern China. Proceedings of the Royal Society B, 283(1839), 20161448. Lin, X.D., Shih, M.J.H., Labandeira, C.C., and Ren, D. (2016) New data from the Middle Jurassic of China shed light on the phylogeny and origin of the proboscis in the Mesopsychidae (Insecta: Mecoptera). BMC Evolutionary Biology, 16 (1), 1–22. Qiao, X., Shih, C.K., and Ren, D. (2012) Three new species of aneuretopsychids (Insecta: Mecoptera) from the Jehol Biota, China. Cretaceous Research, 36, 146–150. Shih, C.K., Yang, X.G., Labandeira, C.C., and Ren, D. (2011) A new long-proboscid genus of Pseudopolycentropodidae (Mecoptera) from the Middle Jurassic of China and its plant-host specializations. ZooKeys, 130, 281–297. Shih, C.K., Qiao, X., Labandeira, C.C., and Ren, D. (2013) A new mesopsychid (Mecoptera) from the Middle Jurassic of Northeastern China. Acta Geologica Sinica-English Edition, 87(5), 1235–1241. Peñalver, E., Arillo, A., Pérez-de la Fuente, R., Riccio, M.L., Delclòs, X., Barrón, E., and Grimaldi, D.A. (2015) Long-proboscid flies as pollinators of Cretaceous gymnosperms. Current Biology, 25(14), 1917–1923. Grimaldi, D.A., and Johnston, M.A. 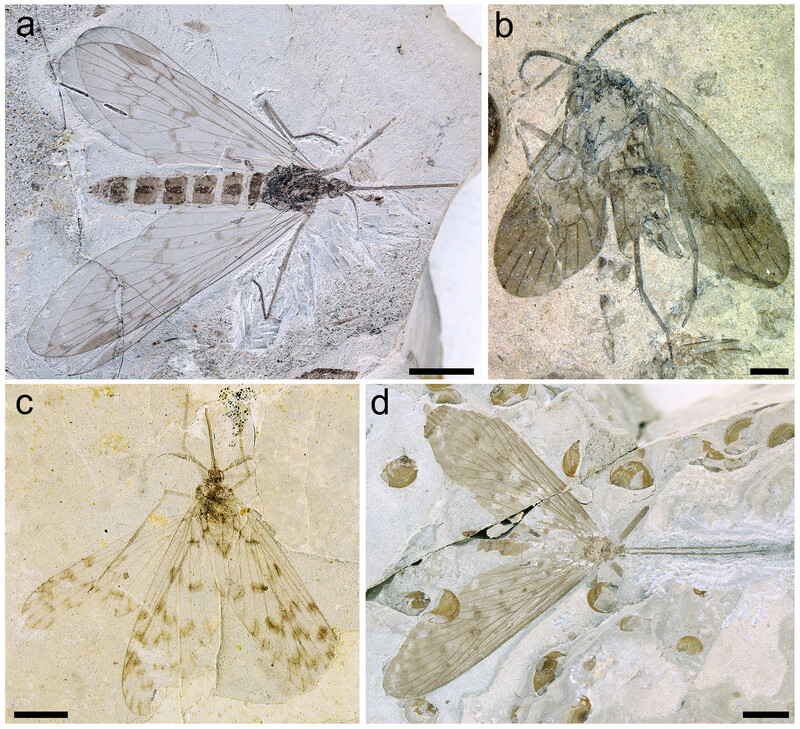 (2014) The long-tongued Cretaceous scorpionfly Parapolycentropus Grimaldi and Rasnitsyn (Mecoptera: Pseudopolycentropodidae): new data and interpretations. American Museum Novitates, 3793, 1–24.